Advancements in the field of education are common practice as each revision and each advancement focuses on making education easier and a more practical methodology to gain knowledge. One such advancement is the introduction of STEAM lessons in the school curricula. Standing for SCIENCE-TECHNOLOGY-ENGLISH-ARTS-MATHEMATICS, STEAM lessons have become an important part of most curricula. Owing to the innovative way these projects encourage learning, STEAM education have become an essential part of most schools today. The cross-curriculum approach and the hands-on learning that STEAM lessons implement has made it a preferred learning tool in many schools. British schools in Dubai and the UAE have implemented STEAM education in an attempt to motivate students to learn through practical and innovative means. When exposed to the activities of Steam, students are taken through a guided round of asking questions, thinking over the answers, applying what they’ve learnt and also solve problems creatively. For example, in an activity that involves the creation of a skull that lights up =, the students will learn about the wiring technique, the meaning behind the creation along with experiencing the whole learning and creating process. Students are needed to think through problems when working on STEAM projects, along with thinking they are required to apply what they learn about engineering and technology in an attempt to figure out the ideal solution. Steam education involve cross-curricular projects which do not only trigger different parts of the brain but also helps students think through various perspectives, the children learn to focus on details and at the same time gain the ability to look at the bigger picture. Steam education allow students to acquire unique problem-solving techniques because STEAM projects require them to solve problems that pop up using the projects, using different methods. Through trial and error, risk taking and by implementing “out of the box” thinking, students implement different ways to solve problems. 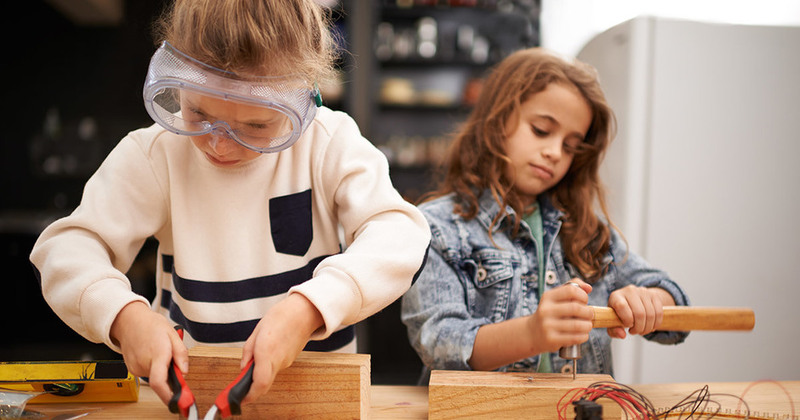 Instead of using a known formula to solve problems, STEAM projects tend to allow students to solve problems in more creative and less typical ways. STEAM projects allow students to participate in hands-on, practical learning. Using tools and equipment, students learn how things are fixed, how they are built and how they work. This helps all the students acquire this knowledge, regardless of their socioeconomic status and their race, levelling the playfield. Art is an integral part of engineering, technology and mathematics and STEAM learning helps reinforce that in students. The use of art can help engagement of students in these projects. Tasks that students may consider daunting at first may become easier as children connect artistic media to more technical projects. When combining the familiar with the unfamiliar, they acquire new skills and discover the world of artistic innovation. STEAM projects include teamwork and dialogues that will enable students to work together in teams and, exchange ideas and ways to solve problems. In this way, children learn to divide work among them, and to work as teams to achieve goals and objectives. The enhanced performances of students associated with STEAM lessons and project, paint a positive picture of the ability of the system to impart knowledge among students. According to a study by Change the education (an organization that supports STEM education which is the American take on the curriculum) the US consists of 3.6 million unemployed workers for every job compared to one unemployed worker for two unfilled STEM jobs. Due to the lack of skills numerous jobs are going unfilled. Skills gained through STEM or STEAM are not only sources for jobs, but well paying jobs. Statistics and the widespread application STEAM in British schools in Dubai and all over the world (and STEM which is a modification of STEM) is an ode to the capability of this system to revolutionize the way children learn!